The employment rate has increased among women during recent decades, while it has declined slightly for men. Between 1990 and 2010, the employment rate for women rose to 57.9% from 53.8%, a 4.1 percentage point increase. 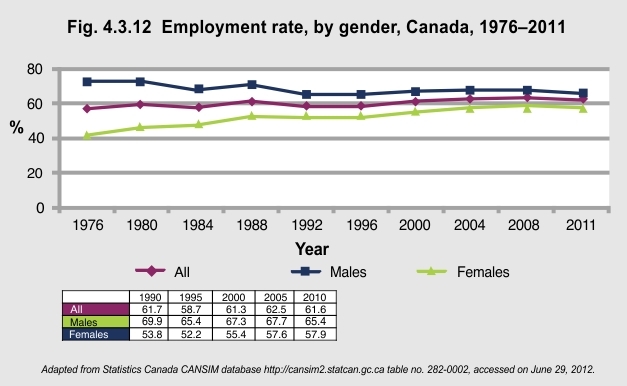 The employment rate for men declined by 4.5 percentage points to 65.4% in 2010 from 69.9% in 1990. 1Corak M, Curtis L, Phipps S. (2010). “Economic Mobility, Family Background, and the Well-Being of Children in the United States and Canada.” http://economics.dal.ca/Files/Econ_Mobility_Family_Background.pdf – accessed on June 29, 2012.